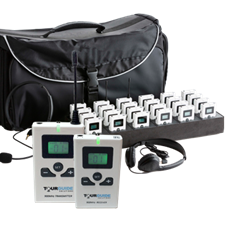 TourGuide Solutions is proud to announce the official introduction of the TGS-900 tour guide system to its product line on http://www.tourguidesolutions.com. Introducing TourGuide Solutions’ newest product line, the TGS-900! The TGS-900 is a compact, easy-to-use tour guide system for the tourism and brewery tour industries. The TGS-900 system offers the perfect alternative for businesses looking to expand tourism opportunities. This affordable system was designed with the small to medium business in mind with simple-to-use and reliable technology. The TGS-900 system is perfect for all kinds of industries, including tours for breweries, parks, university campuses, interpretation, cruise ships, historic landmarks and much more. The TGS-900 is a great option for a full day of tours, offering a lightweight design weighing less than 10 lbs when packed away in its carrying case and smart charging technology, perfect for the busy on-the-go tour guide. Connecting with guests is easier than ever with the lightweight receivers that hang around the users neck, keeping their hands free to enjoy a presentation or steer a Segway. Designed with the tourist in mind, each TGS-900 receiver comes with a lanyard, allowing guests to avoid unreliable clip-on sets. “This system is a great option for businesses looking to give memorable tours that engage their audiences. We are excited for the opportunity to extend our offering and focus on the tourism industry. The TGS-900 is a great option for businesses looking to make a smart purchase,” Alan Ruffell, Product Manager at TourGuide Solutions said. A business looking to grow its tourism activity can trust in TourGuide Solutions’ TGS-900 system, which provides clear FM audio to an unlimited number of listeners. The system can reach up to 600 feet and 25 channels can be used simultaneously, allowing for multiple tours to be conducted at one time or for language interpretation. TourGuide offers a 5-year warranty, making the TGS-900 tour guide system a smart and affordable purchase for anyone trying to break into the industry or simply upgrading their business’s current technology. “We truly believe our TourGuide TGS-900 is a great option to bring anyone’s tours to the next level,” Ruffell said.